Rottweilers are an incredibly obedient breed. But they do not train themselves! It is our job to help them achieve their full potential. This particular breed is mild tempered, loyal, and charismatic. They only want your friendship and acceptance. This eager to please breed can be a wonderfully behaved companion with the proper obedience training. The earlier you start, the better, but there is no Rottweiler out there that is not willing to learn and make you happy. First you need to prepare before beginning your obedience training. You should always have your Rottweiler’s leash and collar, a reward system (like treats or a toy), select a location for your training (your backyard, living room, the park) where you can both feel comfortable and relaxed, and be patient! Patience is very important when training. If you get frustrated, so will your Rottweiler. They pick up on your emotions, so it is best to remain calm, and be prepared to have fun with your companion. Training should be fun for the both of you, this is what will make your obedience training a success. Your Rottweiler should be taught basic obedience from an early age. It is suggested to start between 6 weeks and 6 months. If you have an older Rottie, that is fine, it is never too old to begin obedience training. It may take a little more patience, but if you keep your training fun and simple, your Rottweiler should have no problem picking up on the commands you are teaching them. 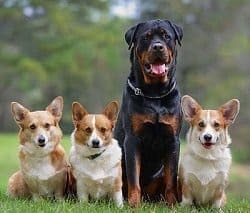 Since you are prepared to begin training, make sure you have your dog’s collar on and their leash attached if you are outdoors (maybe you also want to consider using Clicker for training), or if you simply want to keep them close (your Rottie may be the type that likes to wander off). Have your reward method ready to use in your hand (could be dog kibble, a dog treat, a toy, etc.) and remember to keep calm and be patient with your pooch. You want to get your Rottweiler’s attention by saying their name (I will call my imaginary pet “Rottie”) and tell them, “sit,” in a clear, calm voice. You can push on your dog’s rear while you say this and as soon as their rear is on the ground, you can give them the reward and pat them on the head and say, “Good, Rottie!” in a positive and slightly higher pitched voice, so they understand that you are happy with them. Sometimes it is easier to imagine that your Rottweiler is a child, speak to them like they are children who do not understand. Keep your words to a minimum, but use emotion in your voice. Your Rottweiler will be able to pick up on your emotion more than the actual words you are saying. Once your dog learns “sit,” the next command can be taught in the “sit” position. 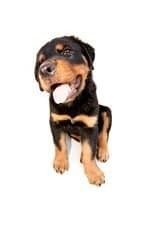 Get your Rottweiler to sit, then say, “shake!” in an enthusiastic voice and pick one of their paws up off the ground. Once their paw is in your hand, tell them, “Good, Rottie!” and give them their reward. 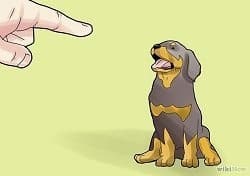 Repeat this exercise, getting your Rottweiler to sit and then pick their paw up and place it in your hand while saying, “shake!”and give them an immediate reward. After a few times, try to get them to do it without having to pick their paw up off the ground. This command can help wonderfully during grooming sessions. If you can teach them to put their paw in your hand, it will be much easier to clip their nails. Next, you can teach your dog to lay down. While in the sit position, and using a calm voice say, “lay down.” You will need to pick up both of their paws and slide them forward until your Rottweiler is laying down. When they are in the down position, give them their reward and tell them how good they are. Continue this until you do not need to lift and slide their front paws. This command is great for keeping your Rottweiler calm. If they are acting too rambunctiously, you can calmly ask them to lay down and give them a reward. This can help keep them quiet and serene. You will need to use your leash for this one. Attach your leash to the collar, and ask the dog to sit or lay down. Then tell them in a calm but firm voice, “stay.” Slowly back away from your Rottweiler. Start with very small increments at a time. When they have successfully stayed put for even a few seconds, walk back up to them (do not let them come to you), and reward them greatly for staying put. As your Rottweiler starts to understand the command and can stay for longer than a few seconds, increase the distance and time you are asking them to stay. This will take lots of practice, but once it is mastered, you can get your Rottweiler to sit and stay where ever you want. The trick to this one is making sure the dog only gets rewarded for staying put. It will confuse them if you tell them stay, tell them they are a good dog, and make them come to you. You must go to them with their praise and then and only then can they move. It is important to remember not to give praise until you approach them. Only after you have mastered “stay” should you attempt “come.” It makes it easier if you teach “come” from the “sit and stay” position. With the collar and leash on the dog, get them to sit and stay. Walk a few feet in front of them and say in a friendly and enthused voice, “Come!” and gently tug on the leash. Don’t get frustrated if they don’t come to you. They are being so good by sitting and staying like you asked them to. You may have to be extra encouraging. When they successfully come to you, and not past you, but to you, give them their reward and great praise. Increase the amount of distance you move from them and continue this exercise until they understand and come right to you. Then you can try to take the leash off and see if you can make them come right to you. If you achieve this, then congratulations, you have successfully trained your Rottweiler the basic obedience commands! Now that your Rottweiler can understand the basic obedience commands, you must continue to challenge them! Just because you taught them to obey your commands in the living room does not mean that they will remember them when they are at the park or in the yard. So continue your training in different locations. And don’t get frustrated. Your Rottweiler has a very short term memory, and when there are distractions, it can makes them forget what you taught them. So always remember that training is never really completed, it is an ongoing process! As long as you keep it fun, you and your Rottweiler will enjoy your obedience training sessions. Hi Chloe, thanks for your comment!